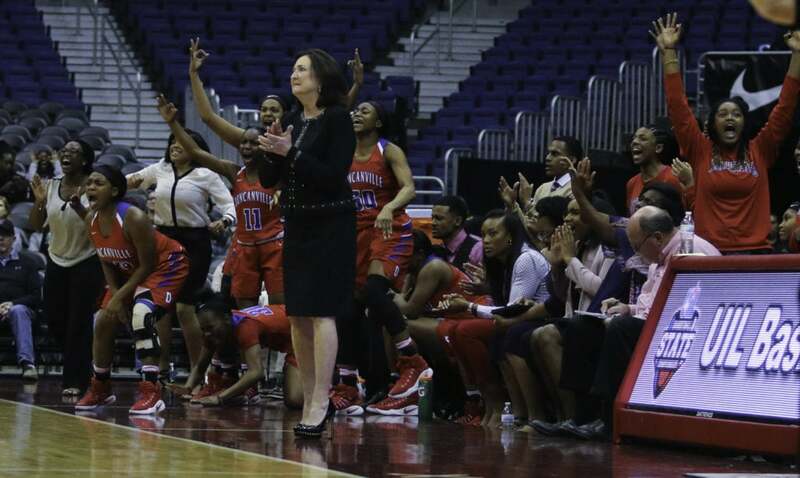 Duncanville Pantherettes head coach Cathy Self-Morgan encourages her players on the court during fourth quarter action against San Antonio Wagner. At the University of Texas' Frank Erwin Center in Austin on February 28, 2014. 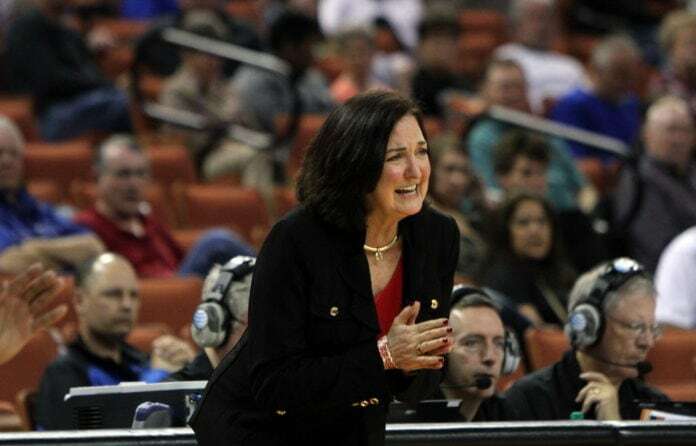 PFLUGERVILLE, Texas—Tuesday morning members of the University Interscholastic League’s Executive Committee met again to hear testimony regarding alleged recruitment misconduct by former Duncanville Girls Basketball Coach Cathy Self-Morgan. After little more than an hour of deliberation the 12 members of the committee deemed Self-Morgan guilty. Self-Morgan was issued a three-year suspension from coaching and a public reprimand. Self-Morgan will be expected to appear before the State Executive Committee before coaching again at a UIL member school. Additionally, the Duncanville High School girls basketball program was issued two years probation. No other punitive measures were taken against the Duncanville Lady Panthers. See video of State Executive Committee meeting here. The decision shocked many after an independent firm investigated the claims and deemed her innocent of any wrongdoing. During a February 6 UIL Executive Committee meeting surrounding the eligibility of a former Duncanville basketball player to join the Irving MacArthur team. Following the close of that meeting Committee Chair Mike Motheral instructed Duncanville Athletic Director Dwight Weaver to investigate claims that had been made concerning unethical recruitment tactics. Coach Cathy Self-Morgan on sidelines at the 2017 girls state basketball championship game. Prior to the investigation Self-Morgan announced her plans for retirement effective March 31. As a matter of fact, the 638-83 coach planned to retire last season but was convinced to stay another year by district officials. “I am glad the UIL investigation is completed, and we wish Cathy Self-Morgan well in her retirement,” Dr. Smith concludes.